Title: BNSF 7204 with BNSF 7279 behind her get closer to me as they head west towards the LA area with a Z-Train. Description: BNSF helpers eastbound while a Union Pacific eastbound climbs Cajon in the background. Description: A northbound intermodal train crosses the dry creek bed approaching Woodford. Title: BNSF 7279 leads a ethanol train past old monroe mo. Title: BNSF 7279 Takes a slow moving Nb freight. Title: BNSF 7279 leans into the curve at Hardin Mo. Description: WB stack train waste no time hitting 60 Mph on the transcon. 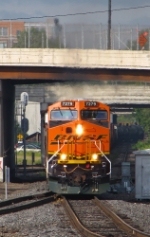 Title: BNSF 7279 Work Eb with a stack train. Description: Last train on the transcon id get in daylight. Description: In days past, this might have been a helper set. Now its just distributed power, a sure sign of how technology has improved railroad operations. An eastbounds DPUs roll away as they head for the midwest.